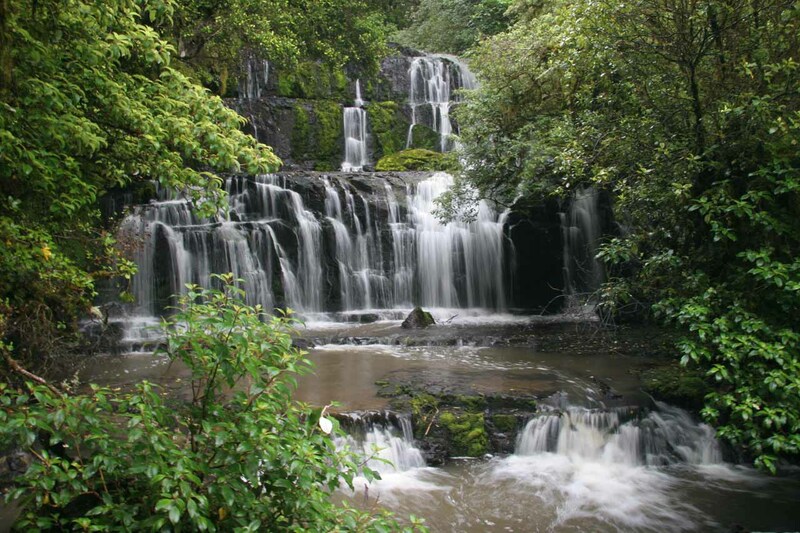 Even though this is a waterfalls website, we recognize that there are many highlights from New Zealand (both involving and not involving waterfalls). 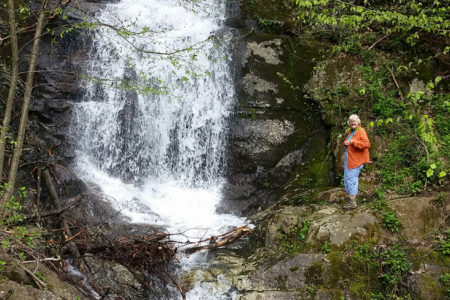 While I recognize that this list is by no means exhaustive and that it is highly subjective, at least you have an idea of what we loved about the Land of the Long White Cloud. 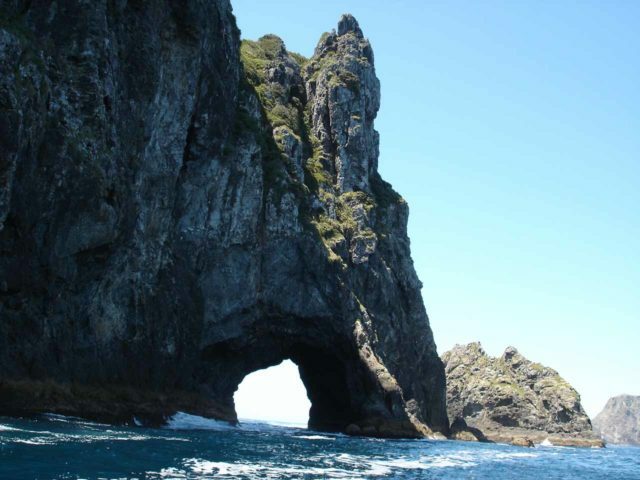 The main attraction here is the offshore Hole-in-the-Rock, which is a giant sea arch that some tour operators may be able to drive their boat through! Since I’m also a fan of natural arches, this was one attraction I couldn’t miss. Of course, there are also other coastal attractions to be had in the overall Bay of Islands area. The lack of crowds and sense of history here really give the area its charm. These majestic trees rival the size of the redwood trees in California. 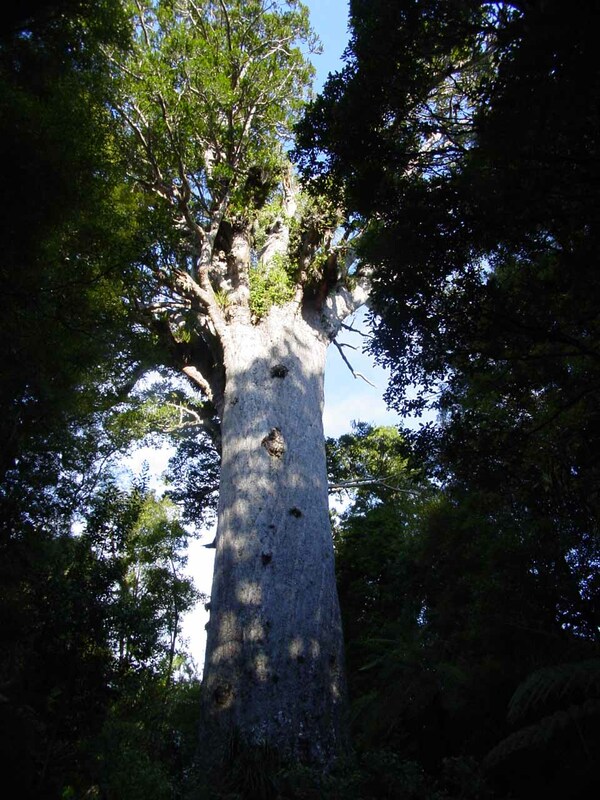 The largest remaining groves of Kauri Trees can be found in the Waipoua Forest in Northland along the aptly-named Kauri Coast. This grove includes the largest living kauri tree called Tane Mahuta. 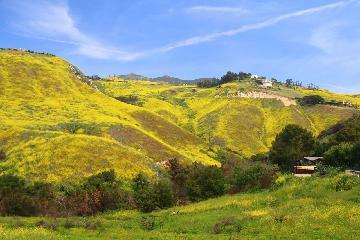 A visit to this area also yields quaint and picturesque coastal towns. Surprisingly just an hours drive west of metropolitan downtown Auckland, the Waitakere Ranges provides a convenient barrier to civilization. 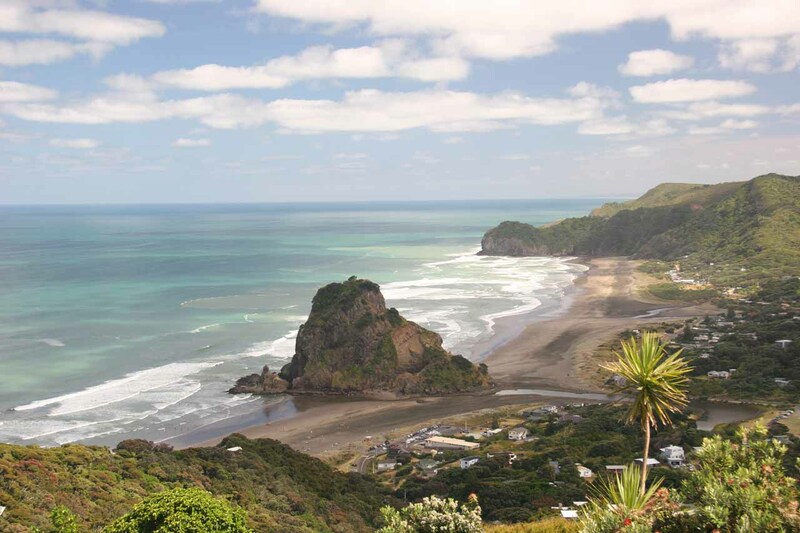 And it left behind some relatively unspoiled beaches like those at Piha and Karekare. 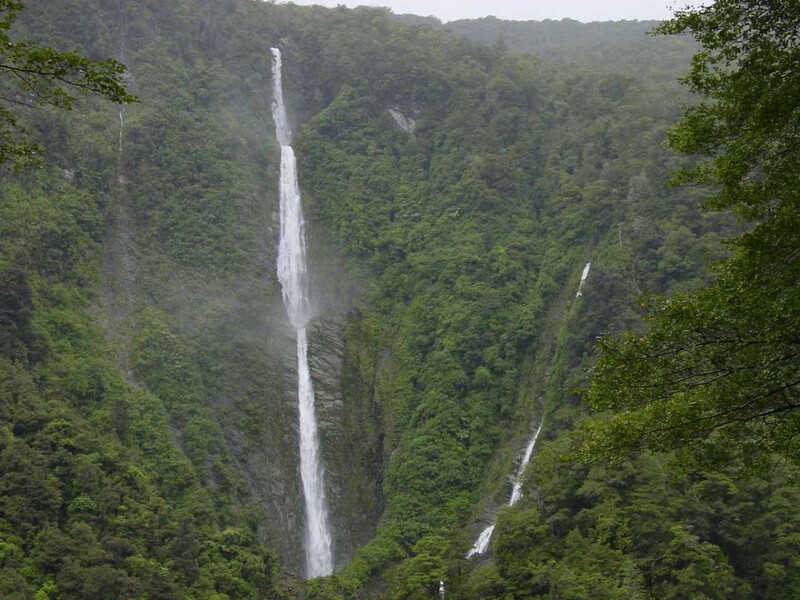 In addition to their soothing sandy beaches, you can still get your waterfall fix from the neighboring waterfalls of Kitekite Falls and Karekare Falls. This scenic peninsula east of Auckland held special memorials for both Julie and I. That’s because we got married in the charming coastal town of Whitianga. Minutes from the charming seaside town was Cathedral Cove and Hot Water Beach. 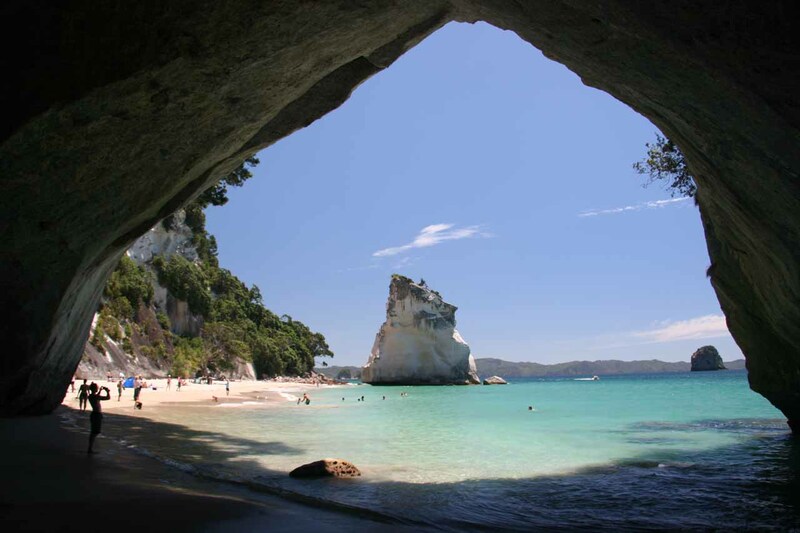 At Cathedral Cove is a large natural arch that is accessible during low tide. Right behind the arch is a beach watched over by Hoho Rock. The 1-hour hike to get to this attraction is well worth it as it provides a gorgeous view of the turquoise blue waters backed by white cliffs. 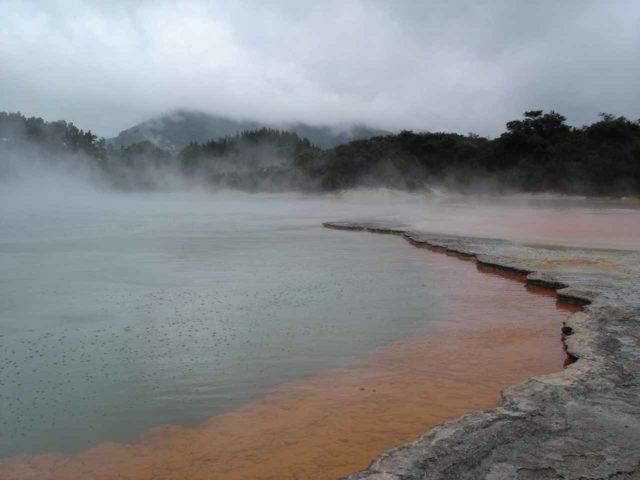 In the heart of the North Island were active geothermal springs and geysers. In parks or reserves like Te Whakarewarewa, we got to see the spasming of the Pohutu and Prince of Wales Geysers as well as several colourful thermal and mud pools along with an interesting mix of Maori Arts and Culture. Similarly, in Wai-o-tapu, we witnessed the Lady Knox Geyser, which goes off at precisely 10:15am each morning. We also stood by the large and colourful Champagne Pool that really reminded me of the Grand Prismatic Spring in Yellowstone National Park. This geologically active volcanic plateau featured a kaleidoscope of colorful terrain and lakes in addition to desolate moonscapes. 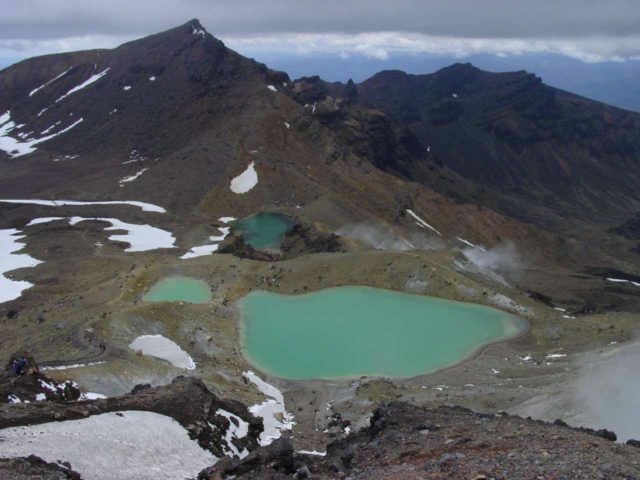 To get the best of what this place had to offer, Julie and I went on the Tongariro Crossing hike, which is perhaps New Zealand’s most popular day hike. This world class excursion took us right through the heart of the national park among volcanic peaks such as Mt Ngauruhoe and Mt Tongariro as well as craters such as the South Crater, Red Crater, and Central Crater. This hike is technically part of the much larger Tongariro Northern Circuit, which is one of the country’s Great Walks, but fortunately, this currently-unregulated track can be enjoyed by all who are willing to make the shuttle arrangements and commit to the strenuous 6-8 hour hike. While on this hike, look for the scenic Emerald Lakes, whose neon green pools were certainly the highlight of the tramp for me. This beautifully conical volcano watches over much of the rural pastures and beaches of the Taranaki District. This mountain doubled at Mt Fuji in the movie “The Last Sumurai”. On very clear days, it’s possible to see this mountain from as far away as the peaks of Mt Ngauruhoe or Mt Tongariro in the Tongariro Crossing. 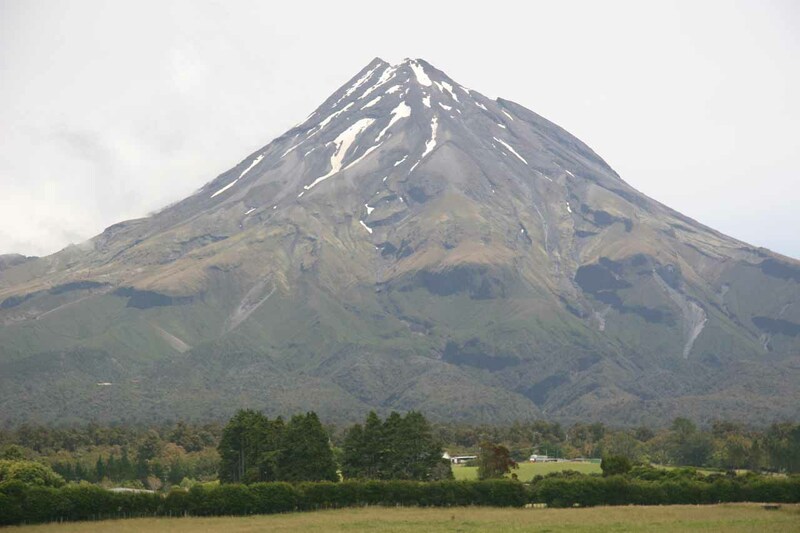 The only downer is that clouds usually cover Mt Taranaki because I believe it is considered on of the wettest spots in New Zealand. This area is the centerpiece of the rugged West Coast between Greymouth and Westport. The Pancake Rocks are striated rocks that look like flattened rocks have been stacked on top of each other like pancakes. Amongst these rocks are a few blowholes that put on quite a display during high tide. If you’re lucky to have good weather late in the afternoon, come here for a most memorable sunset. 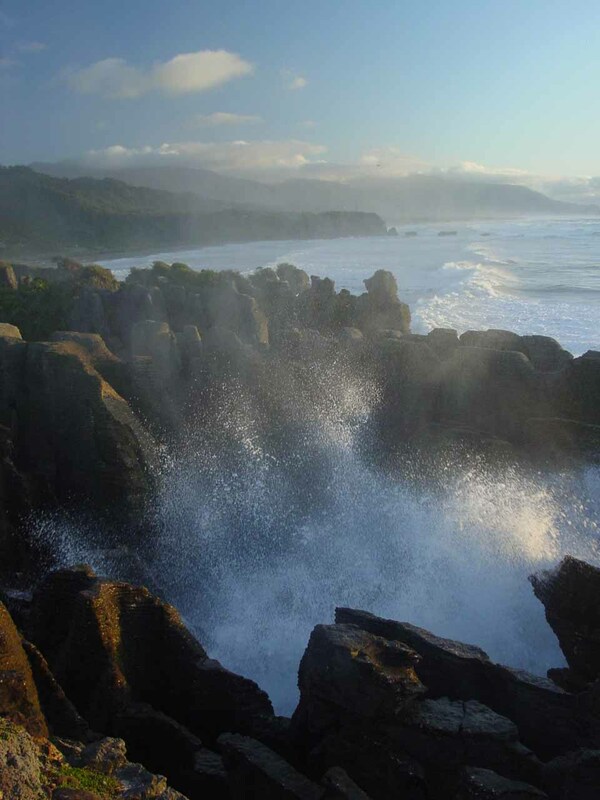 The Pancake Rocks are near the township of Punakaiki and are a part of the Paparoa National Park. This park features interesting Maori archaeology as well as hidden caves and coves just waiting to be explored by adventurous visitors. 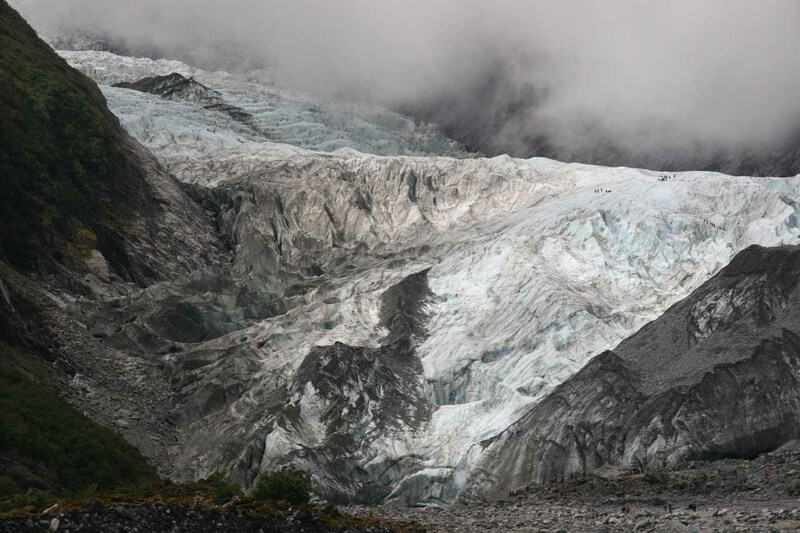 Whether the glacier is under heavy and frequent rainfall or basking in sun, both the Fox and Franz Josef Glaciers were accessible glaciers that descended from the Southern Alps right into a temperate rainforest ecosystem. This aspect of the fast moving glaciers were said to be unique in the world. Heck, we even witnessed the glacier calving at Fox Glacier along with the resulting mini-tsunami. Good thing the trail was way backed off from the watercourse! 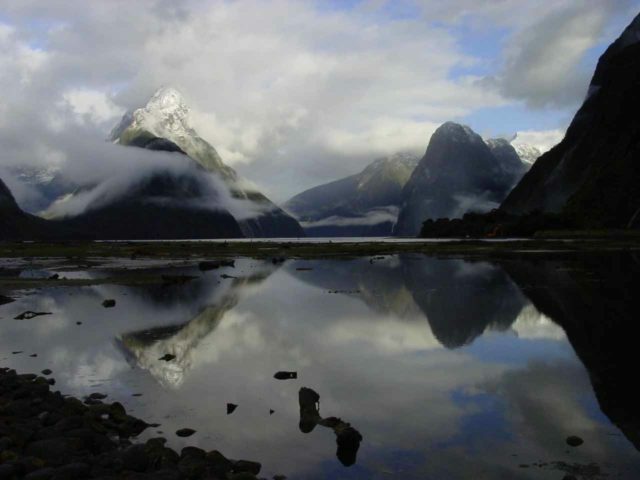 We managed to experience Franz Josef Glacier by helihike as well as a walk to its terminus. We also did a similar walk to the Fox Glacier. As glaciers continue to be endangered or on the verge of disappearing, we seized our chance to experience them before they’re gone! If you’re into arches and natural bridges, then this place is for you. Located roughly 45 minutes from Karamea (near the end of the twisting main highway heading north of Westport), you can experience the long and massive Oparara Arch, the lovely Moria Gate Arch, and (with paid admission), the Honeycomb Arches and Caves, where there are said to be old moa bones. 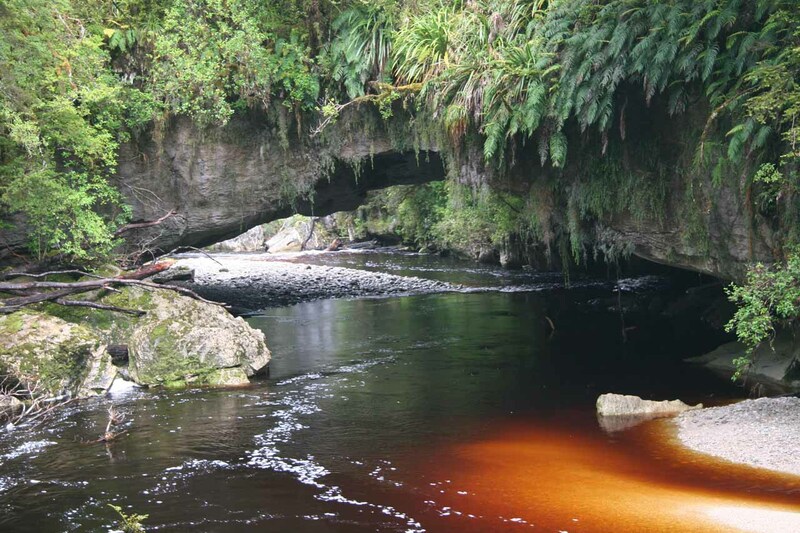 The Oparara Arch involves walking in native bushlands sharing the same ecosystem as the multi-day Heaphy Track. 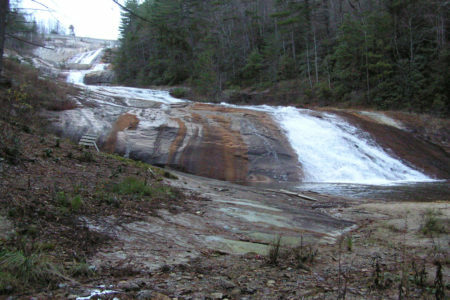 The primitive track passes alongside a red stream before arriving at the massive tunnel-like arch itself. Of course all this raw scenery does have one annoyance you’ll have to put up with, and that’s sandflies! The Moria Gate Arch is another attractive arch that doesn’t require an organized tour. The track follows a well-developed and mostly flat path through more of the native bush scenery this side of the South Island. Ultimately, the track lets you experience this arch in a couple of ways – one way lets you climb down a dark hole and right inside the cavernous expanse of the arch where you’re inside both of the arch’s main openings. The other way takes you to a lookout where you can see a red creek run through the arch (more like a natural bridge) from the outside. This place took us by surprise as we didn’t anticipate spending a whole lot of time here when we set out on our itinerary. But a spontaneous decision to go for a non-guaranteed spot on a whale-watching tour yielded us perhaps our best marine life sightings in the country surpassing even the wildlife we saw while on both the Milford and Doubtful Sound cruises five years ago. 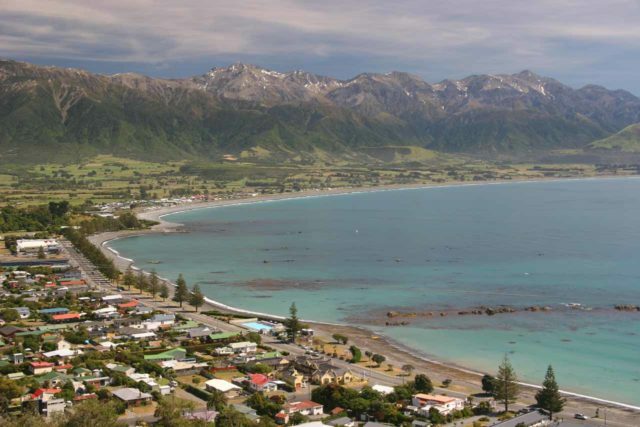 Couple all that with gorgeous weather and breathtaking panoramas of that rare combination of snowy mountains backing beaches and a charming coastal town, and you have the type of scenery only found in New Zealand. As for the marine life spotting, our experience involved seeing three sperm whales each providing you an opportunity to photograph their unique tails as they dive. Of course sightings aren’t guaranteed, but given the equipment and experts on board, you have a very high likelihood of spotting them. Really it’s the seasickness that might get to you if you’re not careful. But our tour also included a bonus sighting of a massive school of dusky dolphins. They don’t call them acrobats of the sea for nothing as dozens of them were playfully doing backflips and swimming alongside our craft as if they acknowledged our presence by putting on a show. You would think you’re in Sea World or something, but indeed we were witness to the real deal. A trip to Aotearoa wouldn’t be complete without paying homage to its highest peak. 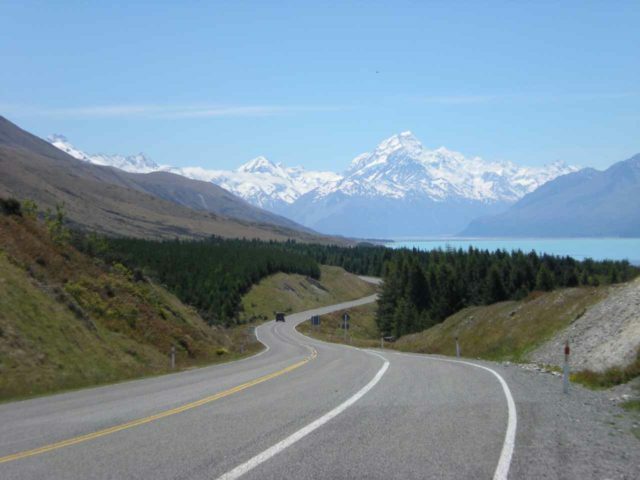 Known as Mt Cook with its Maori name of Aoraki, a visit to its village yields pleasant walks to panoramas of the various glaciers making their way down from the upper elevations of the snow-packed alps as they empty into powder blue lakes and watercourses. Of course the well-prepared and hardy trampers can also make their way up closer to Aoraki itself. On the approach to Mt Cook, we also had to drive alongside the nearly fluorescent blue Lake Tekapo, which showed clear signs of the glacial flour that gave the water its colour. As if the Patagonia-like scenery wasn’t enough, the historic Church of the Good Shepherd as well as the wildflowers definitely gave the Twizel area that extra motivation to stop and soak in the Southern Alps skyline with all that was going around us. This happening city has a bit of a youthful vibe to it as well as a quirky Scottish feel. 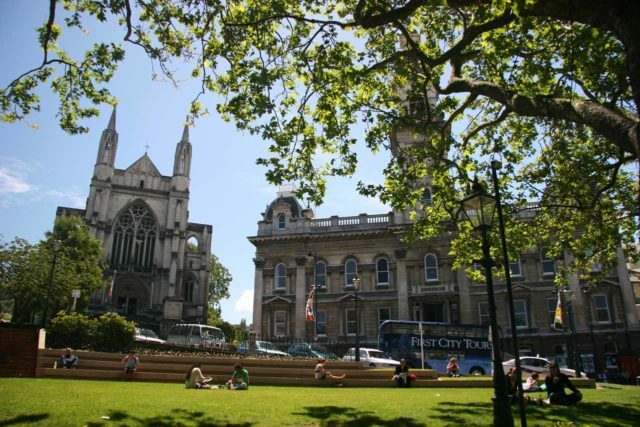 Anchored by a city centre shaped like an octagon, the city also features happening live bands as well as some impressive churches as well as an attractive railway station. Walking around the city almost reminds me of strolling around San Francisco what with all the Victorian buildings lined up amongst steep hills weaved in between by streets. Adding further to the city’s quirkiness was the so-called World’s Steepest Street at Baldin Street as well as a quieter side at places like Sandfly Bay (to see fur seals) and Larnach Castle. Even within reachable distance further up the coastline were the eccentric Moeraki Boulders, which were set amidst a stretch of scenic beach without the crowds that we were accustomed to back at home. 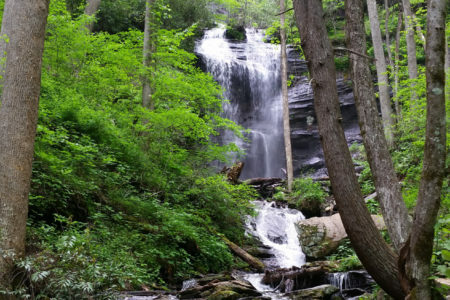 A highlights list wouldn’t be complete without experiencing the country’s waterfalls!